The Dunder Casino Copy Cats slot free spins bonus lets you enjoy the excellent brand new NetEnt game. We love a good free spins bonus and this definitely fits the bill. And that’s not all. Dunder casino offers new players a fantastic welcome bonus as soon as you open a new account. Copy Cats Free Spins at Dunder Casino! 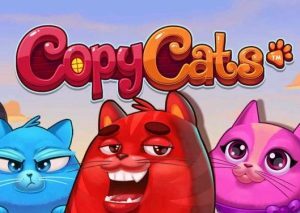 Copy Cats is the new slot from NetEnt. And it’s released today! The slot game doesn’t seem to break any new ground, apart from a very interesting “copycat” feature, but it is actually really good fun! And now you can enjoy a really good new bonus at Dunder casino (one of our favourite recently opened online casino sites). In this case, the new casino bonus is very straight forward (just the way we like it). Simply make a deposit at Dunder casino today and you get 30 free spins on Copy Cats. The promo is live right now so make sure you head over to Dunder Casino before the offer closes. The new casino bonus offers at Dunder casino are always very tempting. However the best bonus is probably the new player welcome package. The bonus starts with a 20 free spins no deposit required bonus. The spins let you play the classic Starburst slots. But that’s not all. On your first deposit your money is tripled up to £50 and another 20 free spins for nine days. So that’s another 180 free spins in total.Further deposits attract even more matched bonuses which means that the total package is worth up to £600! With all of this in mind, it’s a very good time to play at Dunder casino. There are over 600 games waiting for you. Never be bored again. Check it out! The latest BGO Casino Jackpot Winner scooped a £627k win just three weeks after collecting £1.1m on the same online slot! If you fancy your chances then we have an exclusive free spins no deposit bonus for you to enjoy. Join the fun at BGO casino with our exclusive bonus today! It takes a quite a bit of luck to win a slot jackpot. And it takes a huge dose of good fortune to win two jackpots within a month! One lucky player at BGO casino collected a huge £627 win just three weeks after collecting £1.1m! The winner was a woman in her 40’s from South London. She was playing ‘MegaJackpots Star Lanterns’ by IGT and collected the Mega Jackpot. The odds of winning the jackpot twice like that has been calculated as 625m to 1. Now that’s what you call lucky! The lucky player followed hot on the heals of an even bigger winner. Over Christmas, a BGO player from Cheshire won a staggering £6m playing the same slot from a £1.25 bet! It seems like there is a bit of luck for slot players at BGO casino. It may well be worth checking it out with our exclusive BGO free spin no deposit bonus. There is always lots going on at BGO casino. It’s a great place to enjoy the very best online casino action. And luckily we have an exclusive welcome bonus offer for you! Join BGO casino using the button below and you will automatically receive a 30 free spins no deposit required bonus. And the spins let you play on the outstanding ‘Aloha’ slots game by NetEnt. BGO casino is a lot of fun. Check it out! The Super Lenny Casino Air Brazil promotion gives you the chance to win a trip of a lifetime to Rio. We love a free spins bonus. And we love a no deposit bonus. But we also love simple points races that end with big prizes! And this is a good one. Enjoy this wonderful new casino bonus. And if you are a new player you also enjoy a fantastic casino welcome bonus. The Super Lenny Rio promotion is a straight-forward cash race. With a raffle attached. And some very big prizes for the winners! Opt-in to the promotion and you will receive one point for every £10 you wager on slots games. The points are added together to built a leaderboard and at the end of the promotion the top 25 players win a range of cash prizes. First place receives £2,000 and 15 raffle tickets. Cash prizes go all the way down to place 25. But there are 50 free spins that go to the next 25 players in the leaderboard! The raffle has a range of prizes on offer. But the big prize is reserved for the winning ticket holder! The top prize is a luxury trip for two people to Rio De Janeiro, six nights stay in a four star hotel and £1,000 spending money. The promotion is live right now and ends on 15th June 2017. The new Rio promotion is just the latest in a long line of great bonus offers from Super Lenny Casino. When you register as a player you will find that you are regularly offered great promotions. And you will also get a fantastic casino welcome bonus. New players enjoy a 100% matched welcome bonus that is worth up to £50. Plus you also receive 50 Free Spins. And those free spins have a zero wagering requirement attached. What a great welcome bonus. The Mr Green Casino Free Spins Party is goes live tomorrow. There are a total of 200,000 free spins up for grabs. And we love a free spins bonus! There are also a couple of cash drop new casino bonus offers available this week. And, don’t forget that Mr Green Casino also offer a very generous new player welcome bonus. Claim your share of 200,000 Free Spins! There are 200,000 free spins ready and waiting for you at Mr Green Casino! The promotion has been introduction together with Play’n Go slots and is based around 10 of their most popular slot games. Simply play any of the selected online slots games and every winning payline that you hit will generate points for you. The top 4,000 earners at the end of the promotion will receive an equal split of 200,000 spins. That’s 50 free spins to each player. The free spins can then be used on either ‘Hugo’ or ‘Fire Joker’ slots. A 4,000 person leaderboard would be a little difficult to read to say the least. So each successful player will receive an email from Mr Green to let them now they are a winner. The promotion goes live tomorrow and ends on Monday 22nd May. However, that’s not all. Mr Green also has a couple of great cash drop bonuses. The first is the ‘Jack Hammer Cash Drop’. This offer ends on Tuesday 16 May at midnight so you have to hurry. And it is worth a total of €3,000! Mr Green will pick 25 winning players at random. The second is the €2,500 play’n Go Cash Drop. In this case, it’s the Weekend Cash Drop, which features top titles like ‘Book of the Dead, ‘Grim Muerto’ and ‘Viking Runecraft’. There are 25 prizes between €20 and €750 up for grabs. This promotion begins on Friday 19th and ends on Sunday 21st May. All these new promotions are great fun. However, the real value on offer at Mr Green casino is the new welcome bonus. The bonus begins with a 100% matched bonus worth up to £100 when you make a minimum first deposit of £20. And you also then get 100 free spins to play on Starburst slots. Then over the following five says you also get 20 free spins. Which means that you get another 100 free spins! Join the fun at Mr Green casino! The Mr Green Casino Cash Drop promotion is focused on players of Viking Runecraft slot. But there are many more new casino bonuses this week at Mr Green. Including a free spins bonus as well a Betsoft promotion. There is a lot going on at Mr Green Casino this week. It’s well worth a visit! Enjoy the Mr Green Casino Welcome Bonus! There are always great casino bonus offers available at Mr Green casino. And the latest one is a good one. Play Viking Runecraft, the outstanding slot by Betsoft, and you have a chance to win a share of €7,000. The first part of the promotion offers a total prize fund of €4,000. To take part you simply need to play the slot and collect as many High Paying Symbols and Feature Symbols as possible. The number you collect will be transferred to a league table and the prizes allocated to the top 25 players. The top prize is a whopping €1,000! The second part of the promotion offers a total prize fund of €3,000. In this case, a further 20 players will be randomly selected to win a share of the total cash prize. Every player that plays a minimum of 30 rounds at €0.10 is entered into the draw. All prizes are cash allocations so there are no wagering requirements! Happy days! As you can see, Mr Green casino offer some very good promotions for their players. And they also offer a very good casino bonus for new players. Open at new account today and you get a 100% matched bonus worth up to £100 (with a minimum £20 deposit). And there is more. You will also receive 100 free spins to play on Starburst. Over the next five says you also receive 20 free spins. So that’s another 100 free spins. Which means that you get 200 free spins when you join up! There are lots of reasons to join Mr Green casino! The Dunder Casino Bonus Free Spins Promotion is a very good offer. There are free spins up for grabs on the new NetEnt slot, Hansel and Gretel. The offer is only live today – so you need to hurry. And that’s not all. The Dunder Casino Welcome Bonus includes a free spins no deposit required offer. Check it out! Free Spins at Dunder Casino! The special Dunder Casino free spins offer lets you enjoy even more action on Hansel and Gretel slots, the exciting new game from NetEnt. The slot has 5 reels with 20 payline and contains a whole host of fantatsic specail features In fact, it is everything that you expect from A NetEnt slot. It’s great fun! And that means that a free spins bonus is even more interesting. In this case, simply deposit £50 and you get 50 free spins on Hansel and Gretel. You will need to be quick to take advantage of this free spins offer because it is available today only! But don’t worry. On Sunday you get 30 free spins on Sakura Fortune slots if you make a deposit greater than £20. Dunder Casino are very generous with their players and regularly offer great promotions. To make sure you don’t miss out in the future it’s a good idea to join Dunder Casino today. You need to be quick to grab the Hansel and Gretel slots free spins. But Dunder Casino also have a very generous welcome bonus, which is not time sensitive. At least, not at the moment! Open a new account today and you get 20 free spin no deposit required to play on Starburst slots. And that’s just for signing up! Make your real-money deposit and you get another 180 free spins. Plus your deposit attracts a 200% matched bonus up to £50. So deposit £50 and you get to play with a total of £150! Not bad. And there are more deposit bonuses to take the total matched deposit bonus worth up to £600! That’s a very generous bonus. Make your way down to Dunder Casino – you won’t regret it! The Casino Cruise New Website has been launched. And it’s a beauty. On top of the revamp there is a new welcome bonus offering even more free spins. Plus there is also the chance to win a luxury cruise! Check out the new Casino Cruise website. And the new casino welcome bonus. Free Spins at the new Casino Cruise website! The all new Casino Cruise website is the result of months of tireless work. And has just gone live. The new website combines ultra-sleek design, innovative technology and great promotions. And the result is simply stunning! All the best online casinos are now mobile friendly. And Casino Cruise is no different. In fact, it is leading the way with a website that works at least as good on your mobile device as on your laptop. The design brings together top-quality entertainment together with a great user-experience. That means easier navigation and vastly improved payment processing. Payments are now handled by the world-class Payment IQ, which has improved payout speed dramatically. As always, customer service at Casino Cruise is faultless. And the range of online slots and table games is vast. This is really a great place to enjoy exciting online casino action. The revamped Casino Cruise website comes with one very important extra. A brand new casino welcome bonus! In this case, all new players are rewarded with a cool £1,000 and 20 free spins! There are four parts to the £1,000 deposit bonus. Your first deposit attracting a 100% match up to £200. The free spins come together with your first deposit. You will receive 20 free spins every day over a ten day period. The spins are for the classic Starburst slots by NetEnt. All in all, it is definitely a good tine to join the fun at Casino Cruise! The Casino Room Hollywood Promotion give you the opportunity to win a luxury VIP trip. The luxury holiday will take you to Hollywood but there are also lots of cash prizes up for grabs too. The competition centres around the Hansel and Gretel slot by NetEnt, which was released yesterday. Casino Room offer a very generous new player bonus so it’s a really good time to place at this outstanding website! Win a trip to Hollywood with Casino Room! The new bonus from Casino Room is based around the new NetEnt slot ‘Hansel and Gretel’. The slot has 5 reels and 20 paylines, and initial reviews suggest that it is great. And so is this promotion by Casino Room. The promotion is open to all registered players. Wager €10 or more on Hansel and Gretel slot and you will earn one free entry into a random prize draw. First prize is a VIP trip for two people to Hollywood and includes access to Paramount Studios. But that’s not all. There is also €20,000 in cash prizes to be shared with no wagering requirements. Players can earn a maximum of 50 prizes draw tickets per day. The competition is live now and ends on Tuesday 30 May. There is always a great promotion on offer at Casino Room. Which means that the Hollywood competition is just the latest in a long line of great promotions. It’s a great time to join this great casino! Open a new account today and your first deposit attracts a 100% matched bonus up to €500. And that’s not all. You will also get 200 free spins to play on the ever-popular Starburst slots. Casino Room is a great place to place. Have fun! The Mr Green Casino Hansel and Gretel Slots Bonus is a special Free Spins No Deposit required promotion. This exciting new NetEnt slot is part of the Fairytale Legends series and looks like another classic release. The no deposit free spins will be added to your account automatically. And they come on top of the fantastic Mr Green Casino welcome package, which includes 200 free spins and a 100% matched deposit bonus. Grab your no deposit free spins at Mr Green Casino today! No Deposit Free Spins at Mr Green Casino! The new Hansel and Gretel slot by NetEnt is based on the classic Brothers Grimm fable. The slot is the second to be released by the popular software company in their Fairytale Legends series. It follows the outstanding Red Riding Hood slot. Whilst there are always free spins promotions attached to new online slot releases you can always rely on Mr Green Casino to deliver a great offer. In this case, the bonus is very simple. Open a new account with Mr Green Casino between Monday 24 April and Wednesday May 31, and you get 20 no deposit free spins to enjoy on the new slot. That’s a great offer. You should grab it while it is live. This fantastic free spins no deposit required bonus offer is a marketing leading promotion. You will do well to find a better offer. However, that’s not really surprising because Mr Green is a leading online casino. And massively popular with UK players. Which means that it is no shock that the Mr Green Casino Bonus for new players is also top quality. Open a new account today and make your first deposit (minimum £20) to get a matched bonus worth up to £100. And that’s not all. You also immediately get 100 free spins to play on Starburst slots. Then you get another 20 free spins every day for the next five days. So that’s a total 200 free spins. Plus you also get the no deposit free spins on Hansel and Gretel slots! Grab you no deposit free spins at Mr Green Casino today!